Most people will recognize these symptoms of test anxiety. “High-stakes” tests like the SAT, ACT, GRE or LSAT can compound the problem. Approximately one-third of students experience severe anxiety during testing situations, but there are clear steps that can decrease test anxiety’s negative effects. Here are some brief tips. Visit pcs.udel.edu/testprep/resources/test-anxiety/ for full details. A good first response to anxiety is to focus on breathing, taking long, deep breaths while attending to the sounds and sensations of the air slowly moving in and out. With practice this will reduce the unpleasant sensations associated with anxiety and result in a calmer state that puts you back in control. interfere with your test taking if it does occur. 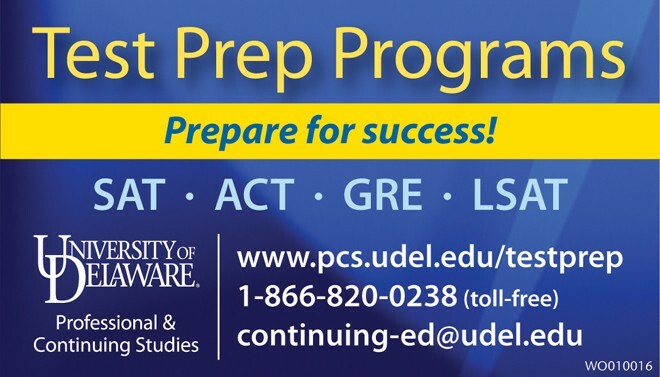 University of Delaware Professional and Continuing Studies offers test preparation courses for SAT, ACT, GRE and LSAT. Please visit pcs.udel.edu/testprep for details or call 302-831-7600.